I recently picked up three free range, rare breed chickens at our local supermarket … for free! Actually, it’s not quite as simple as that but following Hugh Fearnley-Whittingstall’s “Chicken Out! Campaign for a Free Range Future”, televised over the last three days on UK’s Channel 4, I thought my tale timely. 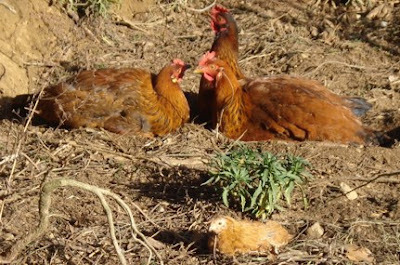 Hugh is trying to get UK consumers to eschew the cheap factory farmed chickens from large supermarket chains and pay a bit extra to buy a free range bird for a fairer life for the chickens and a better quality meat on the plate. 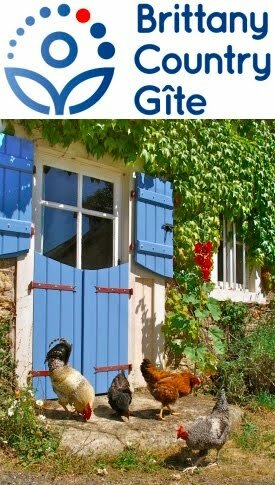 For a French-based permaculture blog, this is all very Anglo-centric and I was going to compare prices, etc., of chickens available here until I realised that we haven’t bought a chicken to eat for a long time, being fortunate to have space enough for a self-regenerating flock of chickens. 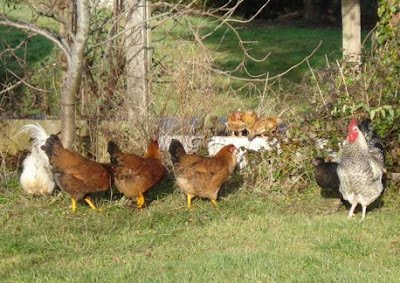 Our chickens are free range, so free range that our old cockerel has chicken offspring at two neighbours’ hen-houses (belonging to Celine and Michel and Alan and Carole) and has thus answered the age old question, “why did the chicken cross the road?” Evidently, for a shag. I was in our local small supermarket, Ecomarché, just before Christmas and, when I got to the checkout, I saw two artists at work painting a large seasonal mural on the shop window, involving a Christmas tree, large snowball and a Père Noël. After I’d paid, I went up to say how good I thought it was (in French) and when they answered I detected a distinctly English accent and that’s how we came to know Alastair and Caroline, English fine artists living and working in Brittany. Some days later, over a cup of tea at our place, they mentioned that they had three “cockerels” that they’d been given by a Dutch guy as a thank you present and who were now causing a nuisance in their neighbours garden and had also outgrown their accommodation, it was time for them to go. Previously vegetarians, they wanted them slaughtered humanely and didn’t want to do the deed themselves. A deal was struck: they’d deliver the “cockerels” one evening and we’d despatch, pluck and prepare them the following morning, keeping one for ourselves for our trouble. Just before D-Day, Caroline phoned to say that she was now unsure that they were cockerels but still wanted rid of them, so would we take them, either for eggs or meat. We delayed until we’d come back from our Christmas travels and took delivery of our three new hens(!) last Saturday evening. As you’ll see in the photos, after keeping them all locked up together for a day to habituate them to their new home and flock, they’ve settled right in and we collected our first egg today. Caroline and Alastair were told that the chickens were a Bresse / Leghorn cross but we’re not so sure. Any suggestions, please post a comment. I am the 'Belgian guy' you mentioned in your blog. First of all I'm glad the breed found a fine home. About the mix: I mistook the mix. The Bresse/Leghorns are still with me. Yours are most probably a New Hampshire/Leghorn mix. I've changed it to read "Dutch" now, sorry for the confusion. 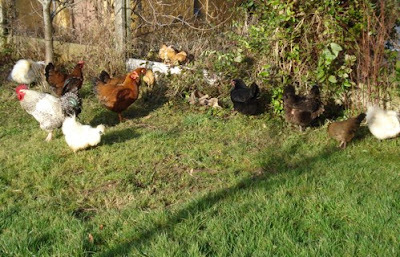 The are truly lovely chickens but one is a real loner and difficult to get in each night, so we're inviting Alastair and Caroline around for roast chicken this Sunday! The others are laying lovely large eggs.